I had slept on the dirt Marron Valley Rd off Campo Rd near Dulzura. While I was eating dinner and watching a movie I was visited by the Border Patrol, checking to see what I was up to. This made for the trifecta on this trip - I had been visited by local police, tribal police, and now federal agents (I suppose I could also have collected a visit by the state troopers) on this roadtrip. Something about a van parked off in the weeds that draws attention, I supposed. All of them seemed to find an old man doing nothing unusual somewhat disappointing. After letting me know that agents would be driving up and down the road all night, they took off. They didn't disappoint - apparently I was on a regular launch pad for patrolling the border. This P900 is located not far from the US/Mexico border, south of Campo Rd. A dirt road signed Little Tecate Rd forks south from the pavement. This dirt road in turn forks several times. The first branch I tried ended in a locked gate, but by taking a different fork to the east before turning south, I found my way to the powerline road that services the transmission lines running across the base of Little Tecate Peak on the north side. From where I parked it was less than a mile and 900ft of gain. The brush is not heavy in this part of the county making for relatively easy cross-country. I climbed directly up to the lower north summit before noting the highpoint to the south across a shallow saddle. A use trail passes through this saddle perpendicular to my line of travel, probably used by immigrants crossing through this area. There were plenty of Border Patrol vehicles that I passed by on my way in and out to the area - getting by them is no simple feat. It took only 30min to reach the summit where I found a Richard Carey register left in 2006. There were four other parties to visit since then, three of which I knew as part of the usual suspects. On the way back I followed the use trail through the saddle and down a steep gully that made for an easier route on the north side. It was only 7:30a when I'd finished with the day's first summit. This curious little summit boasting 1,400ft of prominence is situated in the southwest part of the county. The summit and a square-shaped portion around it are part of the Cleveland NF, but it is surrounded by private property. There is a paved road reaching to the collection of communication towers at the summit, but it is gated, signed for No Trespassing and goes by a number of occupied homes. There used to be one particularly nasty old gentleman that lived high on the hill who would throw rocks down at trespassers. I'd been told that he died or moved away recently, but when I drove through the small community around the locked gate I did not have a very good feeling about it. I didn't want to hike it in the very early morning (no moon) and decided to give up on that approach. I came back after Tecate to explore the Bratton Valley approach from the southeast. This small community of ranch homes has two main roads. Sierra Cielo services the area south of Lyons Peak and it was signed as a private road and looked unwelcoming. Bratton Valley Rd services the east side of Lyons Peak and had no similar restrictions. I drove this alternating dirt and concrete road up to a small turnout I found just east of the peak where a line of telephone poles runs in the direction of the peak a short distance with a barely discernable service road showing though the overgrown brush. Both the south and east sides are rather brushy, rocky and steep which made for a big unknown in this exploratory hike - I hadn't heard of anyone reaching the summit other than by the paved road. The route turned out to be surprisingly enjoyable considering there were some thick sections of brush to contend with. My route took me through a vacant area with two homes on either side several hundred yards distance. Not far enough to escape the notice of barking dogs, but far enough to be no real threat. There were yellow signs marking the national forest boundary where I could at least feel more relaxed now that I was no longer trespassing. Once I had fought my way to the steeper sections where large rock outcrops dominated over brush, it became more of a class 3 scrambling exercise than a bushwhack. And an enjoyable one at that. I spent just under an hour covering the 3/4mi distance to the summit. The highpoint is located at the east end of the summit (where I conveniently reached first) just east of the lookout tower that rises 3-4 stories. The summit rocks had had concrete poured to make a class 3 scramble an easier class 2 one, probably by a bored lookout ranger back in the day. To avoid the many small cliff areas, I kept the return route much the same, getting back to the van by 10a. These summits had not been on my agenda before the trip began. I had noted them the day before as I was driving through on my way to Lyons and Little Tecate where a dirt Barber Mtn Rd forks off at the highpoint of Honey Springs Rd. There is a locked gate with a No Trespassing sign at the start of the road leading to a nice home a short distance away, but I found another gate, open and unsigned that led back to Barber Mtn Rd past the home and heading into the national forest that surrounds Elena and Barber Mtns. The road goes to neither summit, rather winding its way around the northeast side of the ridge crowned by these two peaks. Elena is the nearer summit and much brushier than Barber Mtn. I looked for a use trail of some sort as I hiked the road past it, but found nothing but thick, heavy brush. Upon reaching the NW Ridge of Barber Mtn where the road takes a sudden turn from north to east, I struck off cross-country up the ridgeline finding only modest brush - much easier than it had looked from afar. Someone had been up this way before leaving random ducks along the way. As I neared the summit the ducks increased greatly and became high stacks of rocks. Someone had spent hours around the summit errecting these. My first inclination was to knock them down, but there were so many that I simply didn't want to take the time. 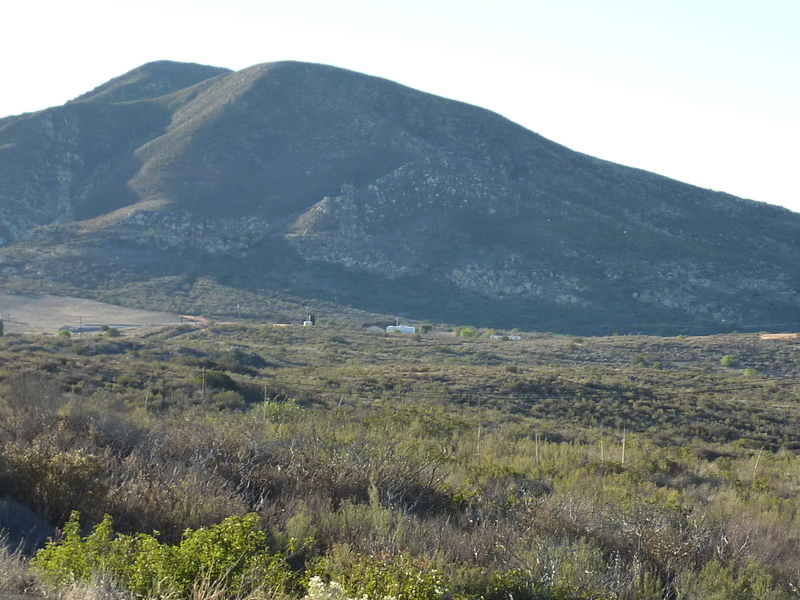 There was nothing else to be found at the summit save for fine views across San Diego County and the rolling, rocky hills that characterize this part of the state. I descended west down a grassier route that had some modest bushwhacking only as I got back to the road. I never did find any signs of road or trail or a reasonable route up Elena and left that for a future exercise.